To celebrate their anniversary, Planetside2 have a full day planned to spend with the community and media networks. On Wednesday, November 20th, 2013, PS2 will be streaming from 10:00 AM to 6:00 PM PST on their Twitch.TV channel. You’ll be able to ask the developers questions, play PlanetSide 2 with them and have a chance to win some prizes like…A bundle of PlanetSide 2 swag, NVidia graphics card and a grand prize of a PlayStation 4! Also Wednesday, November 20th, 2013 at 12:00 AM to Sunday, November 24th, 2013 at 11:59 PM PST, there will be double experience in PlanetSide 2. Prepare yourself for mass battle and lots of Certification Points, soldiers! Steelshanks, Scarabe, ExpBoosted and 1 other person like this. II just got the email and was about to copy & paste here, you beat me to it! Burned up all my boosts... wasted them tbh as I rarely played when activating them. Need another Heroic boost pack to come out, hopefully SOE will see sense and allow me to pad their pockets a bit more. If not ill get one of those 7 day gigs from the store for 500 SC. Well just before my Alpha boost ran out they had another sale and made it look like they were selling the same boost again, but on closer inspection it did not have the resource boost and was just a flat 50% exp boost for the same price. I doubt they will sell another 50% exp boost + resource boost combined, and that will be the only 6 month boost that I will buy. Wednesday is insane farmday for me then. good good. The price appears to be set at 3,999 SC and will be available for ~5 days. 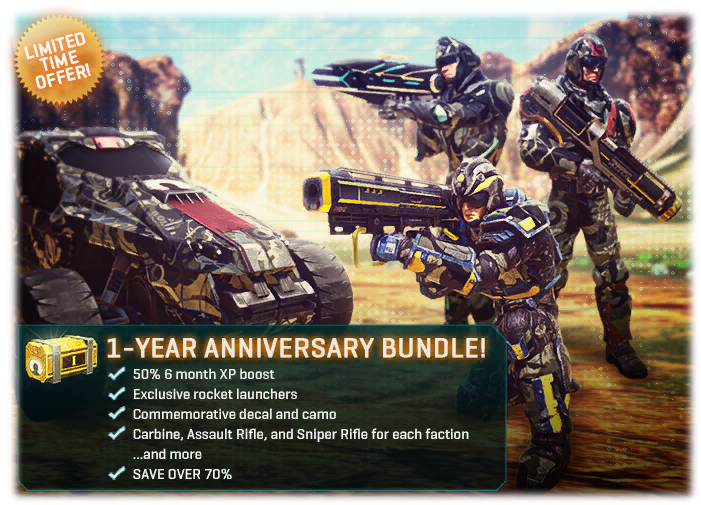 Description: Celebrate PlanetSide 2's first anniversary with this mega bundle. Note: Bundle contains equivalent weapons for all 3 Empires. Looks like they were listening to you. $40.00 is a lot for a gold striker and some cammos but you do get 50%exp and resources. Cant see many people buying this to be honest. It is just to steep a price unless you don't have many of the guns. ...but you do get 50%exp and resources. It's only 50% XP boost, there's no resource boost. The camo is just the Alpha Squad camo in black...not worth it imo. What's the deal with the Striker AE? Is it just a paintjob or does it's stats differ from the regular Striker? I think the rocket launcher are merely copies of the originals with some gold trim added. Lumifiber RPG's, bunch of weapons, some limited edition Camo, and headshot decals... It's tempting, but 5bucks 2 much for me. Very good selection of weapons though, arguably some of the best option in their respective categories. Most of us probably already have several of them though, if not all. Will probably be watching the stream in hopes of winning something. Starting in bout 2 hours 15 mins as of posting this in case anyone else is interested. That's the plan for tonight ,currently running at the moment. Giveaways are US only due to the high value...bastards. you broke my dreams ... I have no other choice to hunt all the dev playing .First playing session is supposed to be EU power hour. But on witch server ? Bagged myself a rum decal and a cola decal. My only guess is that they're really using IRC in the backend, and there's some crazy delay from when the message actually comes out and from when your browser gets it.